A number of our recent acquisitions are in the field of Cuban law. Here are some of the highlights. Raimundo Cabrera (1852-1923), Cuba y sus jueces: rectificaciones oportunas (8. ed. ; Filadelfia: Cía. Lévytype, 1895). Cabrera was a jurist, writer, journalist, and a leader in the fight for Cuban independence. His book is an extended argument for Cuban home rule. This edition was probably published in Philadelphia because the armed struggle for Cuban independence was in full swing by 1895. An English translation, Cuba and the Cubans, was issued the following year by the same publisher. Vicente Blasco Ibáñez (1867-1928), ¿Toros? (Habana: Compañía Editora de Libros y Folletos, 1940). The text is a short story by Blasco Ibáñez, a prominent Spanish writer. 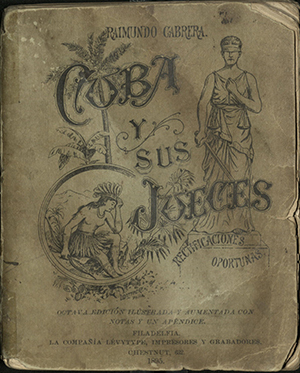 There is an epigraph, “¿Permitiremos en nuestra Cuba un espectáculo tan cruel y anticubano?”, which in English is “In our Cuba, will we permit such a cruel and anti-Cuban spectacle?” The front cover is inscribed “Sr. Segundo Curtis / Ministro de Gobernación / Habana Oct. 1951”. Only two other U.S. libraries report owning copies. 13 leyes de gobierno revolucionario (Ministerio de Estado República de Cuba, 1960?). DALA Suplemento; no. 1. Mario Díaz Irizar, Comentarios a las leyes de marcas y patentes (Habana: Imprenta V. Alvarez Hno. y comp., 1917). This treatise on Cuban trademark and patent law features dozens of stunning full-color illustrations of Cuban trademarks, including 22 leaves of plates. Only four other U.S. libraries have copies. Illustration from Mario Díaz Irizar, Comentarios a las leyes de marcas y patentes (1917).